Gas sampling equipment is one of the most widely used tools in medical, food processing, brewing and landfill gas (LFG) monitoring applications. Units range from gas extraction meters, gas analyzers, and carbon dioxide (CO2) analyzers, to nitrous oxide (N2O) and carbon monoxide (CO) analyzers. 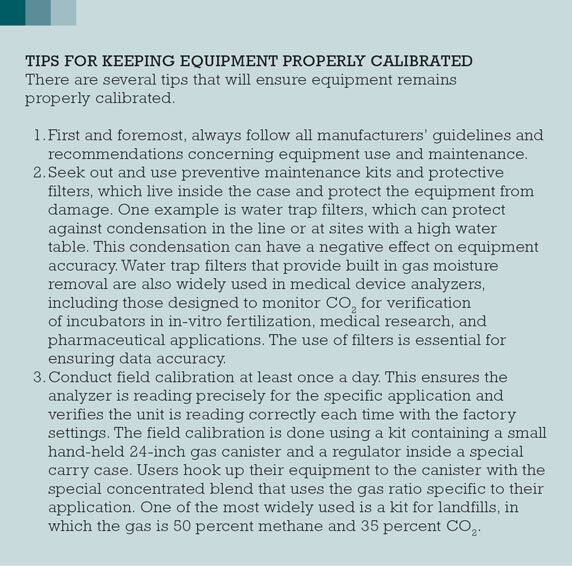 Proper equipment calibration is essential to ensure sample accuracy and equipment reliability, reduce equipment downtime, and eliminate safety risks. Proper calibration ensures that the measurement samples being taken are within the analyzers’ specifications and are as accurate as possible. Calibration verifies that equipment and work spaces are within the desired gas ranges and not out of control. 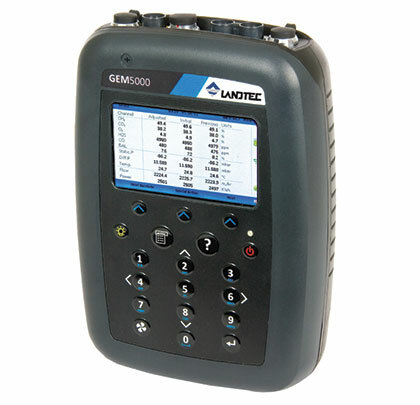 If users conduct a gas check with an analyzer and the ranges are not as expected, they can identify the issue and make necessary adjustments. This helps them maintain regulatory compliance and maximize the equipment’s effectiveness. Calibration is also important for workplace safety. For example, gas analyzer units are used to evaluate the amount of landfill gas flowing from an LFG well. Amounts above certain thresholds can cause environmental and health hazards for those working nearby. If gas analyzer units detect methane above recommended threshold levels, technicians know they need to adjust the wells to regulate the methane by opening up the wells or making other adjustments to tune the well. Since the Environmental Protection Agency regulates LFG emissions gas, analyzer equipment accuracy plays a big part in maintaining landfill compliance. Equipment should be calibrated at least annually; in some cases bi-annual calibration is recommended. A rigorous calibration process should include a robust quality assurance/quality control process filled with manual and automated checks to verify the calibration was done precisely. When repairs are necessary, expert technicians should seek the root cause to correctly repair and service the instrument. Make sure the calibration laboratory is fully certified to ISO/IEC 17025:2005 requirements for carrying out calibrations. 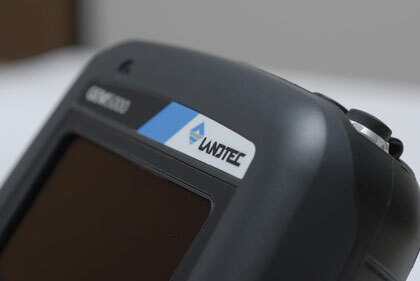 For example, when QED receives one of its Landtec analyzers for calibration and/or repair at its calibration laboratory in Dexter, Michigan, the unit is typically placed in a calibration chamber, and goes through an automated programming process. First, the process verifies the type of analyzer and exactly what is needed to calibrate the specific model. Next, it will perform several pre-calibration tests of the equipment. Then the analyzers are purged with gas to obtain a baseline reading and reach a stabilization period before the actual gas calibration process beings. The gas calibration technician pushes a highly graded research gas through the analyzer at all ranges needed by each model to make sure each one reads within the specifications. The gases used, special mixtures contained in high-pressure compressed gas metal cylinders, should be certified by the National Institute of Standards and Technology (NIST). For example, for EPA’s gas protocol, the gas is made by specialty gas companies that follow an EPA document to blend and analyze individual mixtures using NIST guidelines for their certification. As that is occurring, a programming process is implemented to save the data the chamber is writing and reading to the electronics in the analyzer. 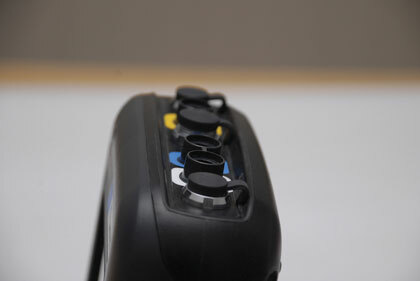 The chamber performs a thermal test and increases the temperature to verify that the analyzer will read the correct parts per million (PPM) of the gases when the environmental changes occur. This is important because gases can change their properties as a result of these environmental changes. Once the thermal check is verified as effective, a final programming step is taken within the analyzer and the chamber’s computer. After the electronics have finalized the programming, calibration technicians run a verification check. This double checks that the analyzer is reading gases correctly and that the programming was performed successfully. This step basically duplicates all the prior actions to determine if the unit sustains its readings. At the QED calibration lab, technicians conduct more than 200 annual and semi-annual calibrations a month, and program the motherboards and port control protocol (PCP) inside the equipment to proper specifications. 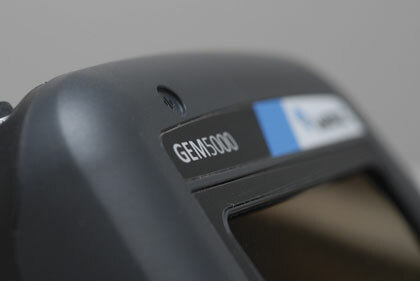 Analyzers may arrive in great condition, needing only a routine annual calibration—or they may arrive with a cracked screen and case after having been crushed under the wheel of a four-wheeler in the field. And everything in between! The best practice is to keep track of equipment and send it in before it is due, rather than when prompted. For example, each QED analyzer has a device information screen that indicates when service is due. If users operate the device after this due date, the analyzer will display a prompt on the self-test screen that comes up each time the analyzer is powered on. Users would have to press a key (skip button) to continue past the screen when prompted that service is overdue. With the level of investment many companies make in these analyzers, it makes good economic sense to stay on top of calibration requirements. For example, QED maintains calibration schedule records for all of its equipment. These records are required for accreditation purposes. Hard copy and electronic copies of equipment service history are kept until the end of life for all equipment sold. Dan McCarty is calibration lab manager for QED Environmental Systems. QED Environmental Systems is the leading manufacturer of innovative environmental products. For over thirty years their expertise has included pumping systems, landfill products, and air strippers. QED will be appearing at several industry events throughout the remainder of 2018, including theWorld Gas Conference in Washington, DC (booth 4135), June 25 through 29 and at Wastecon in Nashville, Tennessee (booth 510), August 20 through 22. For more information, visit www.qedenv.com.